NetWorks is intended to serve as a catalyst for change within the School of Business and the financial services industry itself. In fulfilling this purpose, NetWorks will function as an incubator of intellectual capital. It also will seek to accomplish its goals through the formation of new partnerships among participating educators and practitioners. Indiana State University has received a $20 million grant from Lilly Endowment Inc., the largest gift in the university's history. 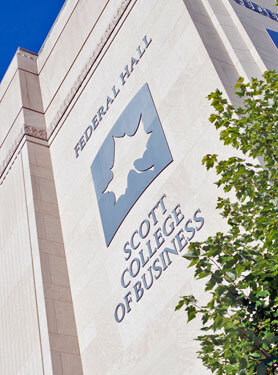 The four-year grant gives ISU the resources to create NetWorks - an outreach of the ISU School of Business to provide new directions in financial services for Indiana, the nation and the world. NetWorks' headquarters will be in Indianapolis, with satellite offices in Terre Haute on the ISU campus, Washington, D.C., and a yet-to-be-determined international location. "We’re absolutely delighted to have the confidence of the Lilly Endowment and we appreciate their generosity," said ISU President Lloyd W. Benjamin III. "It’s going to be an important generating force — not only on our campus, but in the community, state, nation and world." "For years Indiana has been known for its outstanding insurance and financial services sector. Lilly Endowment believes that NetWorks can play an important role in shaping the future vibrancy of this sector of Indiana's economy through its educational and research programs," said Clay Robbins, Endowment president. "We want more people in our state to believe that first-rate activities and resources can thrive in Indiana, and the Endowment hopes that this center will play an important role in affirming this belief." "In formulating NetWorks, President Benjamin and his colleagues have covered every base and included the perspectives of students, the academy, the business sector and government. By so doing, they have significantly enhanced the center's chances for success,” noted Sara B. Cobb, Endowment vice president for education. The grant was announced jointly by ISU and the Endowment during a breakfast at ISU’s Heritage Ballroom and later at the Scottish Rite Cathedral in Indianapolis. The concept of NetWorks emerged from the work of ISU School of Business faculty who participated in a "quantum leap team," as well as representatives of the financial services industry and the state's political leadership. These individuals were charged by Benjamin to examine ways in which the School of Business could build upon its strengths to better serve Indiana. The result was the development of NetWorks - a shared vision designed to capitalize on the school’s history of providing leaders for the financial services industry. Benjamin and Dean of ISU’s School of Business Ron Green will lead the NetWorks initiative, which is designed to build upon the educational innovations of ISU and the School of Business to provide a platform for the development of "reality-based, innovative approaches" to dealing with emerging issues and trends in the financial services industry. "NetWorks will allow us to bring the brightest minds together, to bring faculty, students, scholars, practitioners and executives into an educational setting that can be expanded to deal with issues in the financial services industry as they arise," Green said. The grant will mean profound changes for ISU, its faculty and students, Benjamin noted. It will create even more opportunities for students to gain knowledge and experience not only in the classroom, but in the financial services industry as well. It will also mean greater opportunity for faculty - in the School of Business and other academic units - to be engaged in the global economic perspective, research and product development and design. One of NetWorks' main functions will be to spawn focused Centers of Excellence. These centers may emerge from the issues presently confronting the financial services industry such as risk management or ethical leadership. "The business community has gone through tumultuous change over the last year," said Mike Alley, retired president and CEO of Fifth Third Bank of Indiana. "If you look at the scandals in industry, the questioning of corporate ethics, lack of confidence in our business community, the risk management issues which have arisen due to a variety of terrorist attacks, we truly have gone through dramatic change. I think now more than ever we need something to address that. NetWorks is a program that does indeed do that. It provides scholarly research that can be practically applied." Bill Wilhelm, assistant professor of business education at ISU, said NetWorks will not only be beneficial to students, faculty and professionals, but to members of the community as well. "It’s interesting to note that credit card debt is rampant in our society these days, but credit cards are so easy to get," he said. "It’s also interesting to note we’ve got interest rates that are the lowest in 40 or 50 years and we still have foreclosures that are at record levels. It speaks a little bit about what the public really knows about personal finance." This initiative will have a focus on education for the K-12 schools, providing curriculum and symposia to also reach state legislators, superintendents, school board members, principals and parents, Wilhelm indicated. The NetWorks program will complement and build upon other excellent programs on campus, Benjamin added, for example, the Gongaware Scholars program and the Department of Commerce regional office opening soon in the School of Technology. Those programs combined with ISU’s relationships with leaders in Morocco, Thailand, China and Western Europe provide ISU students with "incredible intellectual resources," Benjamin said. "NetWorks will enable us to think about policy, to put new lenses on issues that are critical to the world’s economy, and those ideas will now come from the Crossroads of America," he said. "For years Indiana has been known for its outstanding insurance and financial services sector. Lilly Endowment believes that NetWorks can play an important role in shaping the future vibrancy of this sector of Indiana’s economy through its educational and research programs. We want more people in our state to believe that first-rate activities and resources can thrive in Indiana, and the Endowment hopes that this center will play an important role in affirming this belief." "We’re absolutely delighted to have the confidence of the Lilly Endowment and we appreciate their generosity. It’s going to be an important generating force — not only on our campus, but in the community, state, nation and the world. NetWorks will enable us to think about policy, to put new lenses on issues that are critical to the world’s economy, and those ideas will now come from the Crossroads of America." "In formulating Networks, President Benjamin and his colleagues have covered every base and included the perspectives of students, the academy, the business sector and government. By so doing, they have significantly enhanced the center’s chances for success." "NetWorks will allow us to bring the brightest minds together, to bring faculty, students, scholars, practitioners and executives into an educational setting that can be expanded to deal with issues in the financial services industry as they arise." "The business community has gone through tumultuous change over the last year. If you look at the scandals in industry, the questioning of corporate ethics, lack of confidence in our business community, the risk management issues which have arisen due to a variety of terrorist attacks, we truly have gone through dramatic change. I think now more than ever we need something to address that. NetWorks is a program that does indeed do that. It provides scholarly research that can be practically applied. It’s exactly what we need to be in a dynamic environment and face these issues and come up with new ideas and solutions and innovation so we can provide some guidance. I’m excited that Indiana State University has been given that opportunity and I’m confident that NetWorks will be a program that can really make a difference." "In my view, as we look back at the ownership and operational changes of the financial services industry in the last decade or so, there’s a need for new approaches and sharing of information and research. The industry has become even more demanding than it was even a decade ago. I see this incubator opportunity that the Lilly Endowment has made available to ISU as a godsend to that end. I think it will help the students gain a greater knowledge of the totality of the financial services industry and the individual uniqueness of each one of them. It will help them to know the common traits as well as the differences through the sharing of information that can occur through this forum. It’s unique because most of the programs throughout the nation and the world today are regulated to one particular area or interest. The beauty of this, as I see it, is that here we will understand each other’s business and the student can learn a lot more about the holistic picture as opposed to being silo trained." Monroe Guaranty Insurance Company, Carmel, Ind. "The NetWorks initiative seeks to attract the attention and participation of the best minds in the financial services field, from academia, government and industry, to create a new and integrated source for resource, education and development in the financial resources field. In building this partnership, Indiana will have the opportunity to claim a new role in the financial services industry. The initiative will also create opportunities for students, faculty and the citizens of Indiana to benefit from and educate themselves about the financial services industry." "First I want to commend the Lilly Endowment for its foresight in recognizing the value of NetWorks and for selecting Indiana State to make it a reality. The original rationale for the Gongaware Center was and is today to develop leaders for the financial services industry, a goal consistent with NetWorks. I can see maximum opportunity for synergy. I look forward to NetWorks providing enhanced professional and educational opportunities for Gongaware Scholars now and in the future. Now more than ever it’s obvious that the business world needs more integrity, higher ethics and certainly more professionalism. Programs like NetWorks and the Gongaware Scholars can go a long way to providing that leadership that I think business needs. This is, without a doubt, a great day for the state of Indiana and Indiana State"
"The question is which thought leader will have the good sense to assemble the best and the brightest minds from industry, government and academia to attack these challenges and exploit those opportunities on a national and international basis. Indiana State University has the depth, breadth and commitment to do that, and we applaud your stepping front and center to lead the way." "It is critical that we work closely with the financial services industry to determine what it is we can bring of value to them that they in turn can create of value for their stakeholders. This work, though, must be seen as seminal because what we learn about the financial services industry will have equal application for all business, public and private, and for individuals and families. This is so because financial services, above all else, exists only to serve other businesses and individuals. … The exciting prospect is that the Indiana State University School of Business and [NetWorks] can take a lead role in helping this key industry do its best work for those who depend upon it to guide them in their quest for a financially sound and secure future. I will speak for all of my associates and colleagues when I say, we can’t wait to begin." "This forward-thinking center will leverage our existing strengths in education, research and application in this important area of business. By bringing together scholars and industry representatives, the center will be in a position to focus attention on identification and solution of problems in a variety of related fields." "It’s interesting to note that credit card debt is rampant in our society these days but credit cards are so easy to get. It’s also interesting to note we’ve got interest rates that are the lowest in, what, 40 or 50 years and we still have foreclosures that are at record levels. It speaks a little bit about what the public really knows about personal finance. There was a survey done just a few years ago of over 1,500 senior high school students, a national study quizzing them on personal finance knowledge. The average score was 57 percent. It was done two years ago [and] the average score was 51 percent. So this initiative will enable us to have a focus on public education and education for the K-12 schools, providing curriculum, symposia to also reach our state legislators, superintendents, school board members, principals, parents. So there’s going to be a lot of education aimed at the public with this initiative." "What it’s going to do is connect ISU with the financial community, with the business world, and that’s going to help with hiring. They’re going to look and say, ‘Oh, she’s from ISU. We’ve heard of them. We’ve worked with them.’ So I think that will help in that and in the learning process altogether. Just having more access, I think, to different things, different experiences. I always feel that the more you practice, the better you’re going to be at something. So, being able to do hands-on things and being able to talk to people who’ve been doing what I’m doing for a long time will give me a better feel for what I want to do and where I want to go." "There is great potential for improved and expanded knowledge about and sharing of information among the financial services industry in a post Gramm-Leach-Bliley era. To have a university setting in which to accomplish this [will] be of enormous benefit to the insurance, banking and brokerage communities." "[NetWorks] is a huge step forward for Indianapolis and the State of Indiana in the financial services industry. The center has the potential to enable Indianapolis to be recognized nationally and internationally for its financial service expertise."